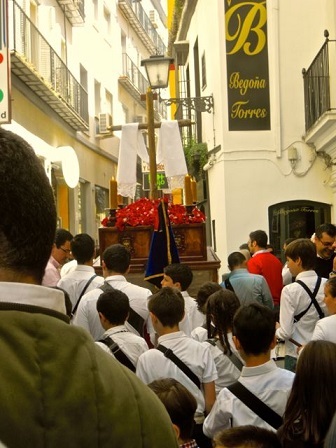 Our new guest author Karen, a US expat living in Spain, introduces us to a lesser known religious and folkloristic custom in Andalucia – the children’s Cruz de Mayo. When people talk about the spectacular spring festivals in Seville, they usually mean Semana Santa (Holy Week) and the huge April fair, but to me, the small, often rag-tag children’s processions of Cruz de Mayo have an intimate charm all their own. One of the things I love about them is that they seem to spring up out of nowhere when you least expect them. One minute you’re dawdling over an afternoon coffee in a sidewalk café, trying to decide if it’s too early to switch to beer, and the next you’re surrounded by music and kids and the support team of parents, grandparents, older siblings, and everyone else in the neighborhood, watching the cross lurch and wobble down the street. The plain wooden cross is the centerpiece of every procession, rising from a platform carried on the shoulders of young boys who attempt (with mixed success) to keep it upright and prevent it from swaying too alarmingly. 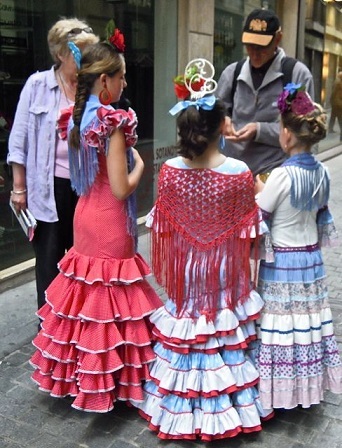 The platform is accompanied by a gaggle of other kids, looking variously solemn or bemused, dressed in ordinary clothes, simple uniforms or, for some of the girls, flouncy and colorful flamenco-style dresses. Somebody might put their drum lessons to use, beating out a background rhythm, or an old tape recorder might provide a tinny soundtrack. The whole effect, especially with the smaller groups, is endearingly impromptu, like something my brothers and sisters and I might have come up with on a dull Saturday, rounding up the neighborhood kids and raiding the linen cupboard for props. In fact, each procession takes considerable planning and organization, and in many cases, no small expense. To recuperate the costs, several children work the crowd asking for donations, which they collect in rattling metal cans – giving rise to the expression dar la lata, literally ‘give the can’, meaning to harass. I’ve never found them annoying – in fact, the kids tend to be almost excessively polite – so I willingly drop in a few small coins. The Cruz de Mayo processions come and go apparently at random throughout the month of May, and have been known to pop up as late as early June. Unlike the much-advertised and massively attended Semana Santa processions, the kids’ versions are modestly attended, and you can get quite close without having to elbow your way through mobs of spectators. You may be in town a week without seeing a Cruz de Mayo go by, or you may stumble across two in a single day. Your best bet is to listen for the sound of drumbeats, the rattle of coins in a can, and the laughter and applause of the neighbors who come out to cheer on the next generation being initiated into the mysteries of the Seville’s spring festivals. Karen McCann is an award-winning journalist, travel blogger and author of the book Dancing in the Fountain: How to Enjoy Living Abroad that describes her expat life in Seville, Spain. “Living abroad is the best opportunity to reinvent yourself outside of the witness protection program,” she says. “It lets you hit the reset button on your life.” She’s an active member of the Seville chapter of InterNations.